The Harbour Dash is an event held in Weymouth bay, starting from one side, going across the bay into Portland Harbour's North entrance, down along the wall and out of the East entrance and back across the bay to the start point. 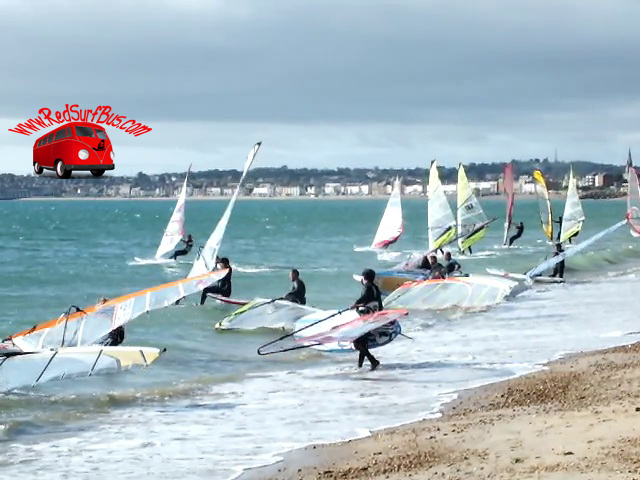 It is a local tradition started in memory of Brian Matthews, a well known and respected windsurfer from "around these 'ere parts". More details can be found here on the OTC website. Norman Petty (of West Kirby fame in a recent article) has organised this event for the past decade. This year, driven by Tris Best from the OTC, and assisted by Norman and Kevin Greenslade, the event has had the publicity that it richly deserves. On arrival I saw about 20 windsurfers rigging up with a couple of fellow Portland Pirates out in the harbour testing the conditions. They were good with dead west wind averaging about 20-25knots. Both team mates went down in the water, something was up. 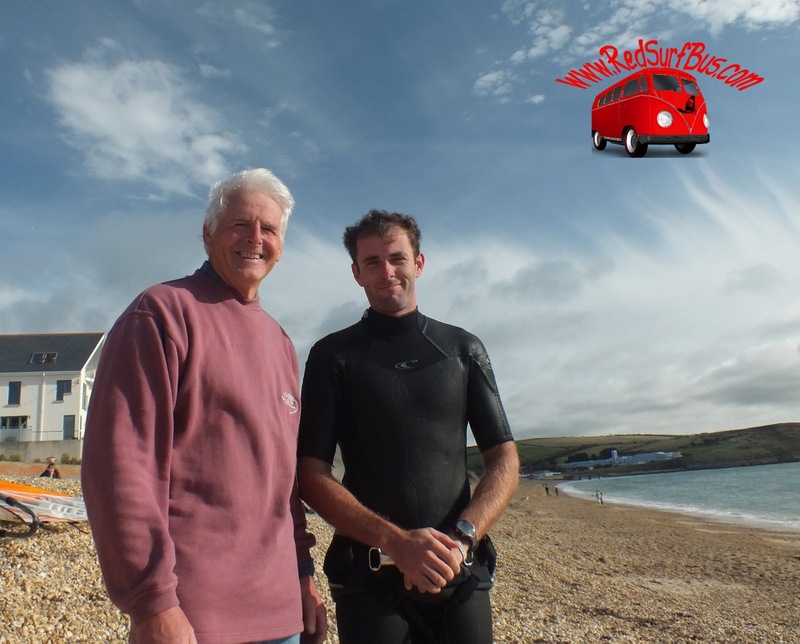 Eventually Pete Young came back to shore with a broken harness line to tell everyone that the fishermen had kindly put lines out that stretched quite a way. Eventually Mark Matthews, Brians son and our team captain (Swagger) managed to swim nearly 500m to shore without his fin. Nick Dempsey with Norman Petty before the race. Nick Dempsey, the Olympian and favourite for the event went for a test run around the wall. He does this nearly everyday so know the route quite well ;-) He went in twice and still came back confident of beating the 20+ year old record set by Ade Bugler. The race brief went ahead and everyone was warned about the fish nets/lines. The wind was pretty constant and in possibly the best direction. The sun was out, it was a dream day for the event, especially after it had to be cancelled last Sunday due to a grand 3 knots of wind. The start line was 100yards up the beach from the cafe, everbody lined up and waited for the start. Once called Sam Latham got a flying start and was well away before most of the fleet had either beach-started or got planing. Nick was hot on his heels, and the pair of them looked to be a few hundred metres ahead by the time the majority were into their harnesses. The wind appeared to drop a little straight after the start. In the middle of the bay the wind was still strong. Here it is crucial to get a good line into the harbour. Fifteen minutes later and it was nearly over, for some. Nick arrived back on shore with a time of 16minutes and 40seconds. This destroyed the previous best which was done over 20 years ago, the old record was 18minutes 35seconds. 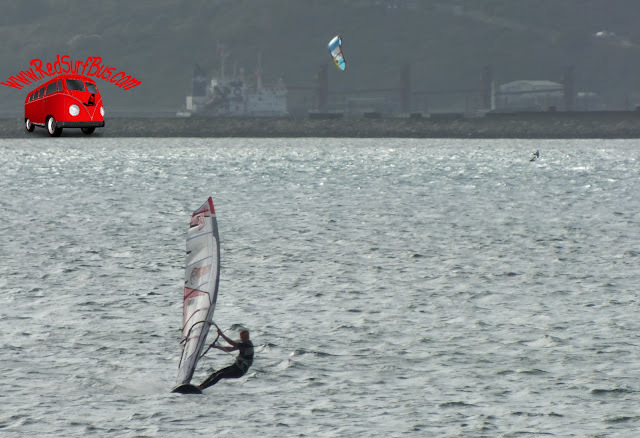 It was a clear new record by an outstanding windsurfer. The full set of results can be found here on the OTC website. Tom Wells, potentially a champion of the future. One result I must mention is Tom Wells, a 15 year old that came 9th with a time of 25minutes 14 seconds. I think that is a great result for someone so young, especially when our team powerhouse, distance man, alpha man and hour destroyer was still no where in sight. I asked Tom if he had a few words. He was a natural with his reply, almost rehearsed. 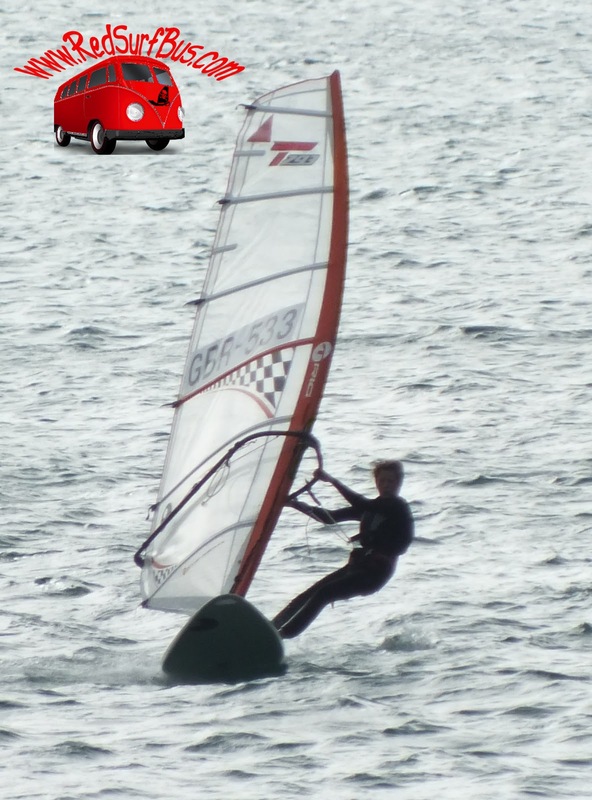 "I thought it was a great experience, I leant a lot because it was challenging with the wind direction. I really enjoyed it." I think Tom will be someone to watch out for in the future, if he is anything like his uncle, Steve Corps then he will become a very skilled windsurfer. Thanks go to Tris and Normski for a great event and I look forward to entering next year once I am back to full fitness. Great write-up Lea. Your time next year mate! Cheers Tris, hopefully I will be able to take part next year. Hoping my time will come next week at Speed week!! !